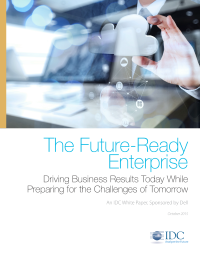 Download this IDC white paper to find out more about the four key IT aspects that define a future-ready a company - and learn why future readiness drives improved business results today. The economic benefits are clear — future readiness corresponds to better business outcomes. But organizations that don’t find themselves at the top of the scale should not be disheartened. Future readiness is an ongoing journey, and organizations can see significant improvements in business outcomes from increasing their future readiness regardless of their starting point. Companies can also drive business results by choosing to focus on improving the specific aspect of their IT future readiness landscape — converged infrastructure, cloud, BDA, and future-minded IT organizational practices — most relevant to their needs.